In terms of general usage the term 'broadband' refers to a type of fast Internet connection that became popular in the 2000s and is fast becoming ubiquitous and considered a basic utility which every household should have access to. There are various technologies that can provide broadband services both using physical infrastructure such as phone cables as well as wireless services such as the mobile networks may offer. In technical terms, it refers to using a wider range of frequencies than 'narrowband' services.. Which broadband technology is best? There is no perfect broadband technology. Some are faster but more expensive whilst others span vast distances. Different considerations come into play depending on what you need to use the connection for, your willingness to pay and what is available in your area. Telephone Lines — These are the most widely available broadband services and can use different technologies from ADSL through to FTTC/VDSL2 (what are commonly referred to as 'fibre broadband' when delivered through your telephone line); you will usually need to pay telephone line rental as well as for your broadband service, although you can often do this through the same provider). With telephone-line based technologies, the speed you can get varies depending on how far your property is from either the telephone exchange or the local street cabinet. Cable TV Network — Most commonly Virgin Media, this uses the cable TV network which was laid in the 1990s and a technology called DOCSIS to deliver high speed Internet. The benefit of cable broadband is, it does not degrade over longer connections, however it is only available in the more populated areas of the UK. Mobile — Services provided by mobile networks (Vodafone, EE, O2, etc.) using 4G/LTE, 3G and similar technologies; these are becoming more popular with the huge increase in mobile phone use. Fibre-to-the-Home (FTTH) — There are a handful of 'full fibre' providers which provide extra fast connections to new-build property, or even in rural areas in the North of Englang. This uses new infrastructure that can deliver the best technical service if implemented correctly, but most properties will be out of reach. So, I need 'fibre broadband' right? Firstly, the term 'fibre broadband' is widely used to mean services that are fast, and use fibre at some point in the backhaul, rather than fibre-to-the-home (FTTH) services. This means that it's possible for a 'fibre' service to be slower than one based on ADSL2+, or it may not deliver as much of an increase as you might expect; you need to look at the specific estimates for your property. Remember that fibre is about the technology, and not necessarily the commercial package you're on, so a fibre service can still be limited to a lower speed for cheaper packages. If you can get a full fibre (FTTH) service, then that will probably be the fastest service you can get, if you subscribe to the faster packages. How fast are the different services? The most common speeds everyone talks about are the download speeds, how fast it takes for you to retrieve content from the Internet. You will also have an upload speed, which is typically much slower for consumer broadband services, which refers to how fast you can send information to the Internet. Cable (DOCSIS)—delivers speeds of up to 300 meg (as of 2017) and we can see a median speed across the UK of 40 Mbps. The above are linked to how technology is implemented to-date and commercial demands for packages isn't always in sync with technology. We have not split out all the technical options (e.g. DOCSIS has various versions, cable broadband has not always been 300Mbps, and can go further with more channels today, if providers decide to offer it). What does 'meg' mean in speeds? The acronym 'meg' was adopted by the major service providers when talking about 'Megabits per second' (not to be confused with Megabytes per second). This can be abbreviated as Mbps or Mb/s, but not MB/s (large 'B') which refers to Megabytes. Although 'meg' is technically incorrect, its widespread use in marketing means most consumers find it more recognisable. Broadband in 2000 was typically offered on a download speed of 500 Kbps (about 0.5 Mbps), hundreds of times slower than it is available fifteen years later. What is important is that you remember that the speeds you get at your property may vary. It is important that when you search for a broadband package, you provide your postcode which gives you an indication of services, and then ask broadband providers for an estimate of the speeds you would get. Why are median speeds so much slower than up to figures? Broadband advertising rules state that an advert most show a speed that 10% of customers on the service can achieve and this is preceded by the words 'up to'. The median speed is the speed that 50% are able to receive, so will be a lot lower, and as our medians are based on speed test results from millions of visitors it highlights the problems people have with things like distance to the exchange or cabinet, bad routers, poor Wi-Fi or just lots of people trying to use the internet at the same time - the dreaded congestion problem. It is expected that later in 2017 broadband advertising may change and feature median speeds for the various products to ensure people have a better idea of the relative performance of different technologies. Availability of broadband in your area—this may restrict your options; when you search our broadband service list, enter your postcode and we'll try to narrow down your options! What you need broadband for—if all you want is to check your e-mail and occasionally browsing Facebook, you don't need a fast service and can pick based on price; if you have a family that love to watch Netflix online with different family members using the Internet at the same time, you may need a faster service. If you're using broadband for work, you may have specific technical or service/support requirements. If your kids play games online, they will want the lowest possible latency, so satellite broadband would be a non-starter for example, so involve the family in the discussion. Decide if you want a 'capped' service with some defined download limit, or an unlimited one. Remember to check what upload speed a service offers, some VDSL2 services only offer an up to 1.9 Mbps upload with competitors offering up to 9 Mbps. Bundling—Many broadband services are bundled with telephone line rental, and you might be able to combine TV services (e.g. Sky, Virgin Media and BT) for savings. A rule change in 2016 means line rental and broadband prices must be advertised as a combined figure and while some do break out the line rental cost not every one does. What contract period you're willing to commit to?—Often the fastest packages can have longer 18-month contracts, so you need to ensure you're not tieing yourself to a commitment if your rental agreement is only for 12 months. You may be entitled to move your service, but you need to read the small print! In the end, you get what you pay for. You can read our latest reports on broadband speeds in our news section. Also, don't forget to check out the current broadband offers. 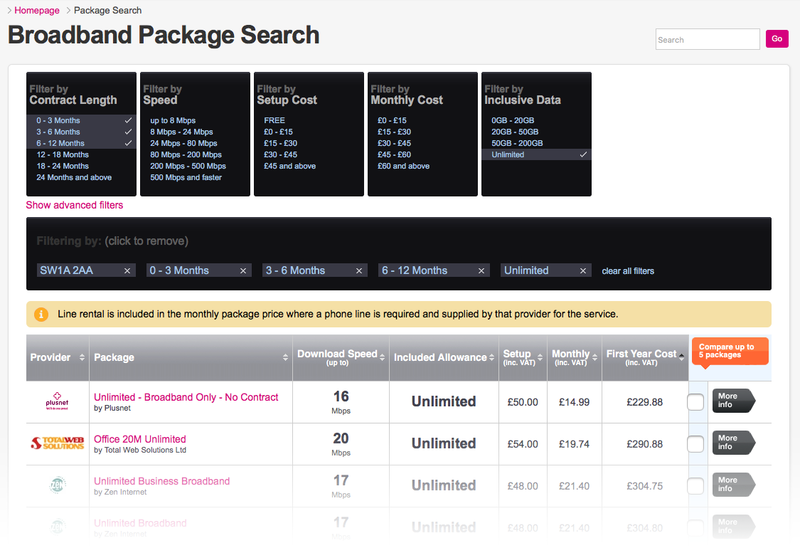 Our broadband package search allows you to select how much inclusive data you need. Don't discount unlimited packages even if you're looking for a great deal. If you're a new user just using the Internet on your own for e-mail and social media, you will probably have no issues with a 20GB package; do check what happens if you exceed this quota. Regular users of Netflix, BBC iPlayer, Amazon Prime, etc. are strongly advised to condier packages in excess of 50GB at a minimum and make sure excess usage charges are not automatic. Most households will prefer unlimited packages as it means you don't have to worry about how much your connection is used; even operating system updates these days can amount to gigabytes, so we would tend to recommend unlimited packages if you're unsure. A broadband router is required to connect to the Internet. This is often provided by or available from your broadband provider, so you should first select a package and see what your provider can offer. Your provider is unlikely to be willing to support you through any technical problems if you source your own router. If you can get your router from your provider, we strongly advise you to do this unless you're technically skilled enough to install and manage it yourself, including dealing with any problems that arise in the future. On DSL services, you may need a micro-filter (sometimes referred to as a 'splitter'—a small device that connects to the other devices (telephones, fax machines, Sky HD boxes, etc.) which filters our the broadband signals from those devices to stop them interfering. Your broadband provider can advise you what you need. If you already have broadband, do consider whether you'd benefit from switching provider once you are out of your minimum term contract. If your package is an old one, there may be far better current deals available if you switch, so consider upgrading to the latest package. Not all providers offer the latest technologies either, so you may find you have to switch to enjoy better speeds when FTTC, FTTP or another better broadband option arrives in your area. How did you access the Internet before broadband? In the 1990s when the Internet was in its infancy, outside of companies and universities who had leased lines, most Internet use was using phone lines with modems, devices which converted data signals into audible tones over normal phone lines. These days, DSL-based services still do this, although the range of frequencies used means you can run a broadband connection separately and at the same time as making phone calls. This also means you no longer pay for Internet access based on how long you are online, but how much data you download (or in many cases the service may be unlimited. A web page might have taken ten or more seconds to download in the pre-broadband days, something you now expect to render immediately. Ironically as web pages become more complex and feature larger pictures the size of a page is increasing, so broadband that was adequate in 2010 will be feeling somewhat slower in 2017.